Midtown Village Fall Festival always draws a large crowd to the neighborhood. Ready for a busy weekend? You're going to want to check out all seven of these festivals happening across the city. On Saturday, there's the Midtown Village Fall Festival, the Mutt Strut with a pet-friendly fest after, the Subaru Fall Festival at Greensgrow Farms and the Indigenous Peoples Celebration at the Museum of the American Revolution. Then on Sunday, there's Old City Fest, Outfest and a block party at the Barnes Foundation. On Saturday, there will be a next-level block party in Midtown Village. In the car-free streets, there will be stages with live music, outdoor dining and tons of vendors. 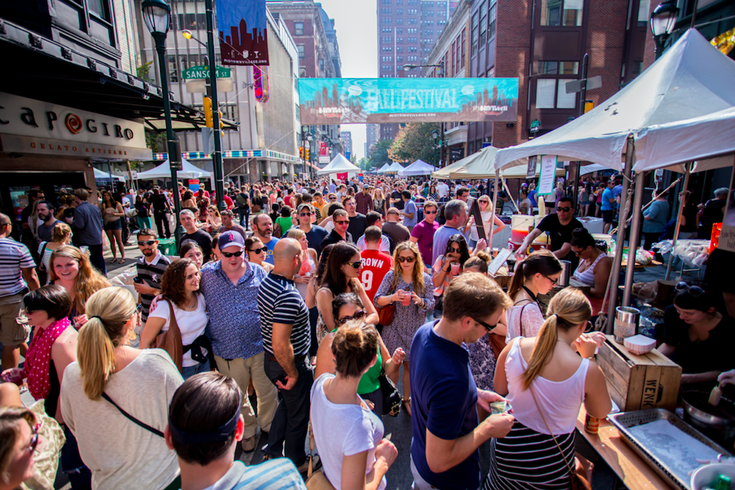 McGillin's and Brü will also have big parties within the festival. If you're 21 or over, stop by and check them out. Take a trip to the historic streets of Old City on Sunday afternoon. There will be circus performers, fashion shows and so much more. This year, rapper Chill Moody and the West Philadelphia Orchestra will perform. Also, look for dueling pianos in the street from Jolly’s Piano Bar. The annual event draws close to 50,000 to Philly's Gayborhood. This year marks the 28th Outfest in Philly. Expect drag shows, carnival-style games, music, hundreds of vendors, specials at neighborhood bars and restaurants, and dancing in the street. Head to the Barnes Foundation on the Benjamin Franklin Parkway this Sunday. In the parking lot, there will be DJs, a beer garden and food trucks. You can also head inside the museum for free to check out masterpieces by Van Gogh, Matisse, Picasso and more famous artists. This Saturday is the Philadelphia Animal Welfare Society's 12th annual Mutt Strut. All proceeds will help PAWS, the city's largest no-kill shelter, with animal rescue and adoption efforts. Have you been to Greensgrow Farms? Saturday, check out the urban farm in Kensington, while enjoying live music and local food and drink. Monday there will be free performances outside the museum by dancers from the Nation, but there's plenty to do at the museum over the weekend, too.